A little primitive but nice. 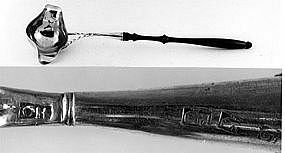 Silver cap at end of wooden handle. Probably by John Gardiner of New London, CT. Eighteenth century. Length 9-5/8". Bowl diameter 2". Total weight 1.4 troy ounces. 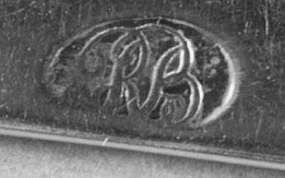 Monogram E/IM on bottom of bowl. Mark and overall condition are very good. Form of about 1770 with upturned handles (tipt on top, no drops), but marked N.Harding and Pure Coin, each in a rectangle. 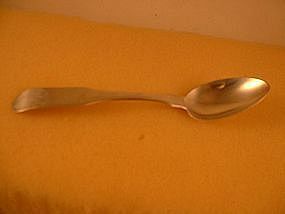 Made by Newell Harding of Boston, say 1840, but probably to match other earlier spoons. Length 8-1/4". Weight 6.25 troy ounces (2.1 ounces each - substantial). 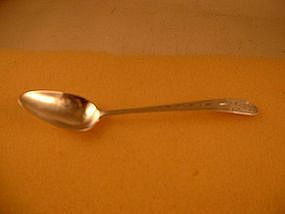 Script monogram on back: HW to SAWM, PHM, HWM - one recipient on each spoon. Overall condition is excellent. Marked J(pellet)C twice. Buhler MFA mark a. John Coburn (1725-1803). Condition of marks: 1 excellent; 1 good-. Pierced and bright cut arms, shell grips. Length 5". Weight 1.5 troy ounces. No monogram. One arm has been reattached, otherwise in excellent condition. Shell grips. Marked on each arm I.McMULLIN in a serrated rectangle (John McMullin, 1765-1843, Philadelphia, Belden mark b). Also marked with an eagle facing left and a diamond with four dots inside (see McGrew). Length 6-1/2". Weight 1.6 troy ounces. The monogram is a script SHS(?) at the bow. The overall and mark condition are excellent. Chicken claws with matte finish, engraving inside and out for half the length of the arms. Marked S.KIRK&SON and 10.15, each in a serrated rectangle. Baltimore 1846-1861. Length 6-3/8". Weight 2 troy ounces. The monogram is a script MHS at the bow. Overall and mark condition are excellent (initial S in mark partially obscured by the engraved decoration). Fiddle, sharp fins, round grips with drops. Marked twice PRESTON. in a rectangle, flanked by lions facing left. Length 6-1/4". Weight 2.2 troy ounces. The monogram is a script AA on the bow. Overall and mark condition are excellent. Downturned, pointed handles. Long drops. Marked W(pellet)Simes in an ellipse (Parsons mark C). Simes (1773-1824) worked in Portsmouth, NH. Length 5-1/2". 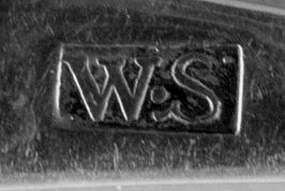 The monogram is S/IM on the top of the handle. Mark condition is good(rubbed). 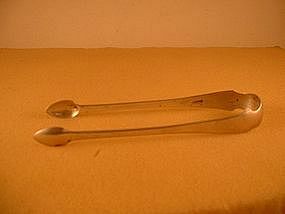 Overall condition of the spoons is excellent. Downturned, pointed handle, drop. Simes (1772-1824) of Portsmouth, NH. Marked W(pellet)S in a rectangle (Parsons mark D). Mark condition is excellent. Length 5-3/8". The monogram is a script TC (? 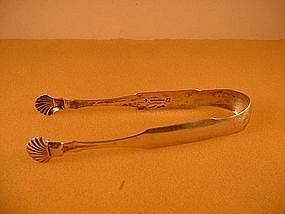 worn) on the top of the handle. Overall condition is very good (monogram rubbed). Coffin fiddle, no drop. Mark condition good (rubbed). Length 5-5/8". The monogram is a script PJ(?). 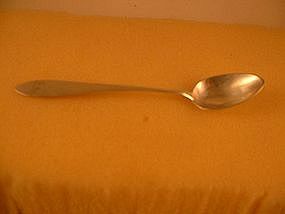 Overall condition is good (a few dents in bowls but not much tip wear). Coffin end. Length 5-7/8". The monogram is a script M. Mark condition is good, overall condition very good (handle needs a little regulating). 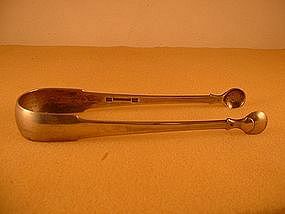 Downturned, rounded handle end, no drop. The mark is Belden mark b. Condition of one mark is excellent, the other very good. Length 5-5/8". 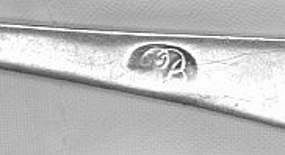 The monogram on the top of the handle is a script T(?). Overall condition is excellent (very slight tip wear). Fiddle, sharp fins, no drop. Length 6-1/16". The monogram is a script RT(?). Mark and overall condition are excellent. Fiddle, sharp fins. Moulton lived 1772-1861. Length 6-1/4". The monogram is a script RKW. Mark and overall condition are excellent.